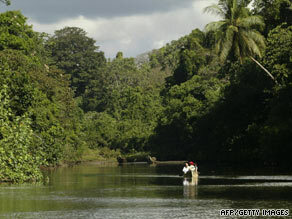 Costa Rica is known for its lush rain forests and pristine beaches. In a report released Saturday, the group ranks nations using the “Happy Planet Index,” which seeks countries with the most content people. In addition to happiness, the index by the New Economics Foundation considers the ecological footprint and life expectancy of countries. “Costa Ricans report the highest life satisfaction in the world and have the second-highest average life expectancy of the new world (second to Canada),” the organization said in a statement. The Central American country, tucked between Nicaragua and Panama, touts its lush rain forests and pristine beaches. Its president, Oscar Arias Sanchez, won the Nobel Peace Prize in 1987 for trying to help end civil wars in several Central American countries. This year’s survey, which looked at 143 countries, featured Latin American nations in nine of the Top 10 spots. The runner-up was the Dominican Republic, followed by Jamaica, Guatemala and Vietnam. Most developed nations lagged in the study. Posted in Culture, DestinationsTagged Costa Rica, Costa Rica Family Vacation, eco tour, eco tourism, Family Vacation, TravelBookmark the permalink.